Maritime Terrorism has become a buzzword among security experts over the past seven years. Incidents such as the attacks on USS Cole (October 2000) and MV Limburg (October 2002) demonstrated in the most graphic and chilling way the vulnerability of maritime transportation infrastructures, of both military and merchant shipping. Historically, the world’s oceans have not been a major venue for terrorist activity. According to the RAND Corporation’s terrorism database, maritime terrorist attacks have accounted for only two percent of all incidents since 1969. This number is relatively small due to the fact that security forces have had to deal with traditional terror groups such as the vestiges of political terrorism and separatist-irredentist terrorist groups. All these groups are characterized by their hierarchical, pyramidal structure and centralized command system. Almost all groups have a regional or local operational agenda using terrorism to target specific people or places, which as a result reduce the damage to small numbers or individual casualties. The sophistication, expense, and training to carry out maritime terrorism necessitate considerable overhead. It requires terrorist organizations to acquire appropriate vessels, mariner skills and, specialist weapons / explosive capabilities. Many terrorist groups are either not located near coastal regions or do not possess the necessary means to carry out maritime attacks. Limited by scarce financial and operational resources, most traditional terrorist organizations have decided not to venture into the maritime arena as the ends do not justify their means. Therefore, following more pragmatic methods, many terrorist groups have preferred to stay with proven successful land based terrorism, especially when selected land targets are not too difficult to attack. Among the most experienced traditional terrorist groups that possess maritime capabilities are the Middle Eastern Palestinian Liberation Organization (PLO), Palestinian Liberation Front (PLF), Hamas, Palestinian Islamic Jihad (PIJ) and the Lebanese Hezbollah. All the above mentioned terrorist groups have a mutual enemy in the democratic State of Israel. Having witnessed the first ever recorded attempt to infiltrate Israel by sea on April 14, 1953, Israel has accumulated a vast amount of experience in combating maritime terrorism. Over the past decades, according to a senior Israeli navy officer, Israel has detected more then 80 maritime terror plots. While most attacks have been foiled, terrorist operatives have learned to adapt to this rapidly changing environment. Incidents - such as the attack on INS Hanit (July 14, 2006) - show that groups such as Hezbollah have stayed at least one step ahead of the security services. Furthermore, as the global jihad movement is closing in on Israel and is experienced in maritime terrorism due to its Yemen operations, the danger has increased. From this perspective, the question needs to be raised whether and how Israel has succeeded in diverting major maritime disasters. Therefore, this essay will analyze Palestinian and Al Qaeda’s maritime capabilities, focusing on the 1970s and from 2000 to 2006. Their past operations will be reviewed, new developments will be discussed, and projections will be given in order to help security services ensure a safer tomorrow. "…the undertaking of terrorist acts and activities within the maritime environment, using or against vessels or fixed platforms at sea or in port, or against any one of their passengers or personnel, against coastal facilities or settlements, including tourist resorts, port areas and port towns or cities." This definition, however, does not define what terrorism is and whether it would only include maritime attacks against civilian (merchant) vessels or also attacks against military crafts. I define maritime terrorism, therefore, as the use or threat of violence against a ship (civilian as well as military), its passengers, sailors, cargo or a port facility with a solely political purpose. The definition can be expanded to include the use of the maritime transportation system to smuggle terrorists or terrorist materials into the targeted country. Given these definitions, the grey area are cases of kidnap-for-ransom incidents, such as the May 2001 abduction of three American citizens and 17 Filipinos at the Dos Palmas resort on Palawan by Abu Sayyaf Group (ASG), an Al Qaeda affiliate. Motivated by the need to finance their political aims, ASG repeatedly perpetrated such acts of piracy. Their actions are an example of the blurring of the distinction between terrorism and piracy. In the Israeli arena however, we have not seen this phenomenon. Israel stands at the crossroads of Europe, Asia and Africa. To the north, Israel is bordered by Lebanon and Syria, to the east by Jordan and to the south by the Red Sea and Egypt. Its western border is the Mediterranean Sea. Israel's combined coastline is 206 km., which puts it in close proximity to hostile neighbors, and to bases that serve as launch sites for terrorists or weapons smuggling. The majority of Israel’s population live in cities close to the shoreline, making them an inviting target for attacks from the sea. The northern city of Nahariya (population of 50,000) is only 9 km. south of the Lebanese border, where Hezbollah has built its maritime bases. To the south, Ashkelon (population 106,600) is just 15 km. north of Gaza, a stronghold of several terrorist organizations and nowadays ruled by Hamas. Eilat (population 55.000) the third largest harbor and gateway to Asia, is 8.5 km. north of Egypt and 2.4 km. west of Jordan. Israel’s major port and naval base at Ashdod (population 204,000) is 25 km. north of Gaza. Fast inflatable boats or scooters can cover such distances in minutes, giving Israel’s security organizations, particularly the Israeli navy, only minutes to identify, evaluate and - if necessary - engage the threat. Besides the threat of a direct attack by terrorists using maritime means to attack its citizens, Israel is a state which depends on open waterways for its economic well-being. In 2006, Israel’s three major commercial ports, Haifa, Ashdod and Eilat handled 37.7 million tons of cargo and 260,000 passengers. According to the Israel Ports Development & Assets Company Ltd, Israel's seaports therefore handle 98% of the country's import and export cargoes. Moreover, Dr Sheinin stated that 93 percent of all security related goods are transported by merchant ships. For many of these essential goods, the maritime transport system is the only economical way for transport due to dimensional and weight restrictions. Israel’s main trade partners are the European Union (especially Belgium, Germany, and UK), Asia and North America. In order to reach these trading partners, merchant ships have to either pass the Straits of Gibraltar, or the Suez Canal, Straits of Tiran, Bab el Mandeb and the Malacca Straits. These straits are often called the arteries of regional and global trade. However, due to the geography of these narrow and shallow waterways, these arteries can be described as chokepoints. Located in geographical areas where local terrorist groups with ties to Al Qaeda possess maritime capabilities. The closure of one or two of these straits, for instance through sinking a VLCC tanker (Very Large Crude Carrier) or Oil tanker, would not only partially cut Israel off from the world market, but also increase the overall shipping costs through the increase of insurance fees worldwide and the re-routing of the ships to longer shipping routes for which Israel’s consumers would ultimately have to bear the increased costs of all imported goods. Having successfully prevented the first attempt to infiltrate Israel by sea on Apr 14, 1953, historically, Israel’s main experience with maritime terrorism came in the 1970s. For the first time Palestinian terror organizations gained experience with and developed maritime terrorism tactics that are still relevant today. Three out of the four major terrorist attacks in Israel in the 1970s were maritime infiltration attacks. Moreover, Israel, as a maritime nation, developed in the 1970s what today is one of the best coastal defenses worldwide. In the historical overview, the author will also briefly go over the relatively calm periods of the 1980s -90s. Following the events of Black September (1970), Palestinians were expelled by King Hussein from Jordan to Lebanon. Taking advantage of a weak Lebanese state, the Palestinians established their power centers in the South and along the Mediterranean coast. Utilizing the geographical location, Palestinian groups such as the Palestinian Liberation Organization (PLO), started to develop maritime capabilities alongside land based techniques. Realizing the possibilities of attacking not only Israel's seaside towns but also Israel’s main cities such as Tel Aviv, and the moral significance associated with such an attack to Israel’s general population, prompted the PLO to increase its training to develop naval expertise and gain special knowledge such as diving. Training therefore was mainly conducted in Lebanon and Syria but also in Libya, Egypt and Algeria. However, as the Israeli northern border defenses did not pose a serious problem for these organizations in crossing into Israel and perpetrating terrorist attacks in the early 1970s, the option of penetrating Israel from the sea was not yet seen as imperative. Therefore, the terrorist groups focused their maritime activities on smuggling weapons from Syria and Cyprus to supply their camps in Lebanon and from Lebanon to Gaza, while only conducting smaller operations to test Israel’s response. With the increase of Israeli navy activities in the Lebanese arena during 1971, PLO and other Palestinian terrorist organizations focused on collecting intelligence on Israeli ship movements and harbor visits in European cities and Cyprus, in order to conduct maritime terrorist operations using mines placed by divers; and developing other maritime capabilities, including remote controlled boats and divers brought by a mother ship, in order to attack Israeli ships, especially tankers, in Israeli harbors. The Popular Front for the Liberation of Palestine (PFLP) under Dr. George Habash, stated that Israel, as an abandoned island, surrounded by enemies, can only stay in contact with friendly states by air or sea transportation … “hence we must block these lines”. Their developed expertise led to the sinking of the Greek charter ship Sanya on March 4, 1973 in the Beirut harbor. Carrying 250 U.S. tourists bound for Haifa, Israel, it appeared that an attached mine detonated prematurely, as Fatah and Black September later claimed that the mine was designed to explode in Haifa. Following the Yom Kippur War (1973), the PLO intensified their cross border terrorist raids murdering the victims or taking them hostage, in order to use them as bargaining chips against the Israeli government. In light of this escalation, the IDF not only carried out cross border raids to destroy terrorist infrastructure, but also increased the effectiveness of its defensive measures by improving the border fence and increasing its patrols. Preferring the use of media effective hostage-taking, the Palestinian organizations had to adapt their terror tactics and therefore shift towards the use of their maritime capabilities to infiltrate Israel. On June 24, 1974, the first of such attacks was perpetrated by three terrorists in Naharia. Having set sail from Lebanon, the team landed on the Naharia beach, seizing several hostages in a nearby apartment building. Before being killed in a gun battle with Israeli security forces, the terrorist succeeded in killing four and wounded eight more. As an immediate response, the Israeli security forces and especially the navy, increased their security measures on the northern border to prevent further infiltration, by setting up not only a radar station and lookouts at Rosh Hanikra, but also introducing security zones in which no civilian shipping and swimming was allowed. Moreover, Israel’s navy increased the number of patrol boats stationed near the northern border to three. These security measures successfully prevented most of the attempts to cross directly from Lebanon into Israel. The last successful attack (attempts still occur) that made use of this tactic, was the murder of the Haran Family in Naharia on the night of April 22, 23, 1979. Four terrorists from Abu Abbas’s Palestine Liberation Front (PLF), landed on the beach in a rubber boat killing a policeman and attacking an apartment building. Capturing a father and his four-year-old daughter, the terrorists killed both when the police arrived. Attempting to conceal her second daughter from the terrorists, the mother accidentally smothered her. Abu Abbas later stated that the attack was a protest against the Egyptian-Israeli peace treaty. Following the implementation of tougher security measures on Israel’s northern border, the Palestinian terrorist organization changed their tactics in order to circumvent these measures. The terrorist organizations resorted to a tactic already conceived in 1972 – the use of mother ships. The idea was to circumvent the heavily defended northern border and launch smaller attack dinghies from a mother ship outside Israeli territory. Once launched, these fast dinghies would travel east in Israel’s blind spot, in order to land “out of nowhere”, at Israel 's major metropolitan cities. The first such attack occurred on March 5, 1975 when eight terrorists landed on the Tel Aviv beach and attacked the Savoy hotel. Barricading themselves together with thirteen hostages, the terrorists threatened that if the Israelis did not release 20 Palestinian prisoners within four hours, the hostages would be killed. In the morning, the Israeli commando unit Sayeret Matkal stormed the hotel, killing seven terrorists and capturing one. Five hostages were freed and eight were killed. Three soldiers were also killed. A few hours later, the mother ship which had transported the terrorists, was captured by the Israeli navy on its way to Cyprus. The timing of the terrorist attack was clearly aimed to coincide with the visit of the U.S. Secretary of State, Dr. Kissinger, who intended to promote a political settlement between Egypt and Israel. Panic-stricken, the PLO hoped that by carrying out a terrorist attack they would sabotage Dr. Kissinger’s mission. Moreover, the attack was designed to kill Jews and non-Jews, in order to enhance Arafat's prestige in the eyes of his supporters and coalition partners. Established after the Yom Kippur war, the Fatah naval arm was linked operationally to its special reconnaissance and intelligence unit, lead by the head of Fatah’s military wing, Abu Jihad. Fatah’s naval arm underwent basic training, including diving instruction, in Egypt, Libya, Algeria and Syria. In mid-January, 1975, the group which was comprised of Hader Muhammed, Musa Juma El-Tallka, Muhammed El Masri, Muhammed Mashala, Ahmed Hamid, Ziad Talk El Zrir, Musa Awad and Abu El Lel, commenced training as a team at the Fatah training base at Duma. At the end of the month, the group was transferred to a training base of the naval arm in Latakiye, before being transferred in February to a Fatah base in southern Lebanon. Here the group received final instructions in the art of bargaining for human lives. The group also received instructions on how to conduct the mission. According to the original plan, the group was to split up and operate as two separate units, barricading themselves together with the hostages. They would threaten to blow themselves up if their demands were not fulfilled. Furthermore, the group was given prepared propaganda that would further their aim in preventing a peaceful settlement between Egypt and Israel, by making claims which would incriminate Egypt, thus drawing Israel into a reprisal that would make Dr. Kissinger’s efforts worthless (if caught) or, if the mission was successful, the group would claim that it was a Fatah cell from the Israeli-held territories; thereby increasing Arafat’s prestige in these areas. In both cases the propaganda was to conceal the involvement of both Lebanon and Syria. Reality, however, proved otherwise; not only was the operational execution of the plan insufficient, as the group stayed together, but the propaganda stories were discovered and the crew of the mother ship was taken prisoner. While the defense establishment swore that any terrorist penetrating Israel “should pay the full price for this savage and crazy method”, the general Israeli population was struck with anxiety, as the feeling prevailed that there was no place within Israel that would be safe from terrorist attacks. Moreover, the immediate result of the Savoy attack was that Israel’s hotel industry had many cancellations of bookings made by foreign guests and delegations such as the Vienna Burgtheater, which canceled its show which was to take place in Israel on March 13, 1975. The Israel Defense Forces' (IDF) response to the Savoy attack was to increase naval activities, including the use of missile boats along Israel’s Mediterranean and the Lebanese coasts. Moreover, the IDF used aircrafts to search the Mediterranean for suspicious ships and established coastal observation points, artillery batteries and used reconnaissance units to patrol the beaches in order to prevent further infiltrations from the west. While these security measures prevented some attempts by the Palestinian groups to copy the Savoy operation and led to the surrender of a speed boat team at the Tel Aviv Marina (September 1976) and the capture of mother ships such as the Ginan (March 1979) and Stephanie (March 1979), it did not prevent one of the major terrorist attacks in the history of the State of Israel. The Coastal Road attack on March 11, 1978 killed a total of 37 Israelis and injured more then 70. Orchestrated by Abu Jihad (Fatah), thirteen terrorists set sail on March 8, 1978 from Tyre, Lebanon on board a mother ship. The plan was for the terrorists to land in two dinghies on the shores of Tel Aviv, taking hostages in order to free five imprisoned terrorists. However, as the captain of the mother ship was afraid of being caught by the Israeli navy approaching Israel, he made the terrorists disembark onto their smaller dinghies further away from the shore then planned. The Captain of the mother ship exploited the navigational ignorance of the terrorist group, in order to secure his own safety. Furthermore, the stormy sea on that day complicated the navigation and caused the death of two of the terrorists. Eventually, eleven terrorists, led by Dalal al-Maghrabi, landed on the Maagan Michael beach, killing six people whom they encountered on the way. After stopping two buses and herding the passengers together into one bus carrying over 70 hostages, most of them women and children, the terrorists headed south towards Tel Aviv, firing at passing cars. Determined to prevent the bus from entering Tel Aviv, the police blocked the road just north of the city and succeeded in halting the vehicle. In the resulting gun battle between the police and terrorists the bus caught fire due to a terrorist grenade. Nine terrorists involved in the attack were killed and two captured. As the Israeli security forces did not know the fate of all the terrorists, for the first time since 1968, they imposed a curfew over the population area between northern Tel Aviv and Nethanya, while thousands of troops and police searched for terrorists thought to be still at large. The curfew was called off the following evening, when it became clear that none had escaped. Encouraged by their successes, the Palestinian terror organizations continued their attempts to infiltrate Israel from the north. However, as the IDF, and especially the Israeli navy, continuously enhanced their defensive measures along the northern and the Mediterranean Sea borders (the only successful infiltration from Lebanon directly into Israel was the murder of the Haran Family in April1979), the terrorist groups searched for the weak spot in Israel’s coastal defense. On September 30, 1978, the Israeli Navy intercepted and sunk a bomb-laden freighter, Agius Demetrius, off the Sinai coast near Dahab. This foiled a plot devised by Fatah to attack Israel’s southern coastal city and sea port of Eilat. The terrorists intended to destroy the oil tanks and pumping stations of the Eilat-Askhelon pipeline, by firing 42 Katyusha rockets into the port of Eilat, and then ram the 600-ton boat, crammed with 5-6 tons of explosives (TNT), onto the beach which was crowded with tourists for Israel’s New Year (Rosh Hashanah). The ship's keel was designed to explode on impact with the sand. According to a senior Israeli navy officer, the Agius Demetrius had been fitted with rocket launchers in Syria and with explosives in a Lebanese port. Being under surveillance by the Israeli Security Forces, the ship sailed through the Suez Canal and the Gulf of Suez o where it was intercepted sailing under a Cypriot flag. The seven terrorists aboard the vessel were captured and the heavy armaments were seized before the ship was sunk. A second example of the advancement in maritime terror tactics by terrorist organizations in general and the PLO in particular, was the attempt to blow up an oil tanker in the Eilat harbor with the help of European divers in March 1997. On September 25, 1985 (Yom Kippur) a team of three Palestinian terrorists belonging to PLO’s Force-17 seized an Israeli yacht in the harbor of Larnaca, Cyprus. Accusing their hostages of being Israeli spies, the terrorists first demanded the release of 20 Palestinian terrorists held in Israel in exchange for the three Israelis. Later, however, the terrorists murdered the sailors in cold blood before surrendering to local police. On April 25, 1988, the first ever maritime suicide operation occurred in the Lebanese arena. Perpetrated by a member of Ahmad Jibril’s Popular Front for the Liberation of Palestine – General Command (PFLP-GC), the suicide bomber steered a fishing boat loaded with explosives near an Israeli naval vessel and detonated it. No casualties or damage were reported by the Israeli navy. This attack came seven years after the first suicide bombing perpetrated by the Iraqi Shiite Dawa Party on the Iraqi Embassy in Beirut in December 1981. Until 1997, five maritime suicide attacks against Israeli naval vessels were registered. All attacks were carried out against Israeli boats patrolling the Lebanese coast and were carried out by either Palestinian (PFLP-GC, PFLP, Fatah etc.) or secular Shiite Lebanese (Amal) organizations. On May 30, 1990 Israeli security forces foiled an attempt by PLF terrorists to infiltrate Israel from the sea near Gaash and Nitzanim. Code named Al-Quds, the 16 terrorists departed from Benghazi, Libya on May 27, 1990 on a Libyan ship. According to PLF leader Abu Abbas, the preparation for this operation had taken nearly three years and cost about three million dollars. Sent by Abbas in October 1988, Muhammad Ahmed al-Hamad Yousef, the deputy commander of the operation to Libya, and the rest of the raiding party, underwent intensive training, including the use of rubber boats and speedboats and being trained in firing from ship to shore. Abu Abbas and Abu Kassem (Commander of the PLF naval forces) met them every four to five months to monitor their progress, but his deputy Abu Ez was with them all the time. The plan involved shelling hotels and houses from the sea, using 107 mm Katyusha rockets, 23 mm cannons, and machine guns. Furthermore, they were to enter the Sheraton hotel and kill everyone they encountered. According to Abu Abbas the operation was in revenge for the killing of Palestinians in Rishon-le-Zion on May 20 1990. In order to prevent detection by Israeli aerial reconnaissance, Abu Ez and Abu Kassem ordered the raiders not to go on deck during the day time while sailing on the mother ship. According to the plan, the terrorists disembarked from their mother ship on May 30, 1999 in six speedboats. Made out of fiber glass and equipped with two engines, the speedboats could reach twice the speed of Israel’s Dabur patrol boats. Moreover, five days before the operation, the six speedboats were painted with a special paint in order to decrease their detection by radar. One of the boats further served as a tanker for the other boats. The terrorists were split up and sailed on separate boats called: Hittin, Mislon, Hatij, Castel, Port Said and Alfao. However, the difficulties started as one of the speedboats sank while being lowered into the sea. While the mother ship turned back towards Libya, the terrorists continued with five speedboats. Later on, two more boats broke down, the tanker-speedboat also turned back toward Port Said and the 16 terrorists continued their journey on the remaining two speedboats. While one boat headed north-eastward with five terrorists and finally was intercepted by the Israeli navy some 40 km off Gaash, the second speedboat headed south-eastward toward Nitzanim. Alarmed by the capture of the first boat near Gaash, the second boat was located by a reconnaissance plane and a Dabur patrol boat, which however was unable to engage the speedboat. The terrorists reached the shore and started to run eastward, constantly monitored by the IDF jet. IDF combat helicopters engaged the terrorists, killing four of them while seven terrorists surrendered to the arriving infantry forces. Following the failed plot, the PLO announced through Kaled al-Hassan on June 4, 1990, that the PLF operation was utilizing the wrong technique “because everyone knows that Israel has stated that its radar lab can scan as far as Malta. From the technical point of view it was an act of madness.” Hassan also said that Abu Abbas had no right to launch such an operation and give the enemy a bigger weapon against the PLO, which had not announced until then the annulment of its peace process. Abbas on the other hand stated that the PLF had not informed Arafat (PLO), about the operation in advance and was not obliged to do so. Furthermore, Abbas pointed out that the main target of the operation was a recreational center for senior military officers. President Bush announced on June 19, 1990, that he was suspending the ongoing PLO-U.S. dialogue until the PLO denounced the attempted attack. On May 30, 1992 four Palestinian terrorists from the PLF swam five kilometers from Jordan to Eilat pulling rafts loaded with weapons. One of the water-proof containers began to leak in the water which resulted in one of terrorists drowning. A second container leaked and had to be cut loose. The remaining two terrorist reached Coral Beach where they killed an unarmed Israeli security guard and attempted to massacre tourists, but were prevented by police and army troops. The Israeli ship Jrush Shalom was bombed on December 25, 1993 while it was docked at Eilat. No fatalities were reported, however, eleven people suffered injuries. The Palestine National Liberation Movement, a Fatah fraction, claimed responsibility. With the signing of the joint Israel-Palestinian Declaration of Principles (DOP) on September 13, 1993, Israel agreed to transfer government in the Gaza strip to the Palestinian National Authority (PA). Allowing members of the PLO to return to Israel (Gaza and the West bank) had several complications. First, it allowed returning terrorists with special maritime skills to reduce the geographical distance to possible targets within Israel. Second, the continuous peace talks presented ample opportunity for Sunni Islamic groups, such as Hamas and Palestinian Islamic Jihad, to sabotage possible peace plans. Moreover, the expulsion of the Palestinian groups from the Lebanese arena under Operation Peace for the Galilee gave ample opportunity for Shiite groups, first the secular Amal, and later the Islamic Hezbollah to take their place in attacking Israel. Due to Israel’s developed coastal defense system along the Northern and Mediterranean coast, terrorist organizations similar to the ones of the 1980s and 1990s turned their efforts towards attacking IDF forces in Gaza itself and to carry out attacks against Israel from and in foreign countries. Having experienced maritime Fedayeen raids (1950s and 1960s) and smuggling operations, the Gaza Strip presents a unique concern for Israeli maritime security. 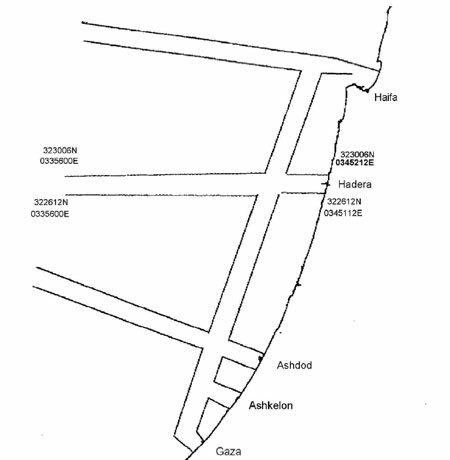 Documented in the Gaza-Jericho Agreement (May 4, 1994), the sea off the coast of the Gaza Strip is governed by a series of Maritime Activity Zones (MAZ). 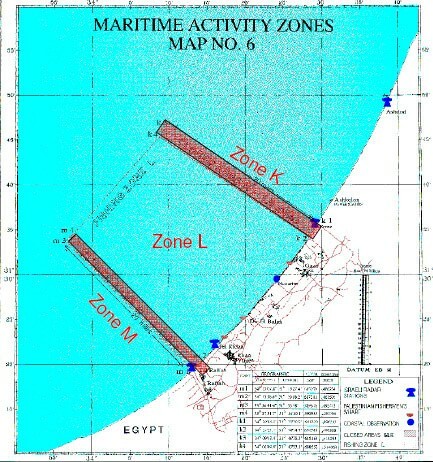 Implemented to thwart seaborne terrorist infiltration and smuggling efforts, the MAZ are composed of three Maritime Activity Zones labeled K, L and M. The two outer zones (K, M) are sterile security zones that extend 20 nautical miles off the coast of the Gaza Strip. Zone K extends in the sea from the coast in the northern part of the sea of Gaza and 1.5 nautical miles wide southwards, while Zone M extends in the sea from the coast and one nautical mile wide from the Egyptian waters. 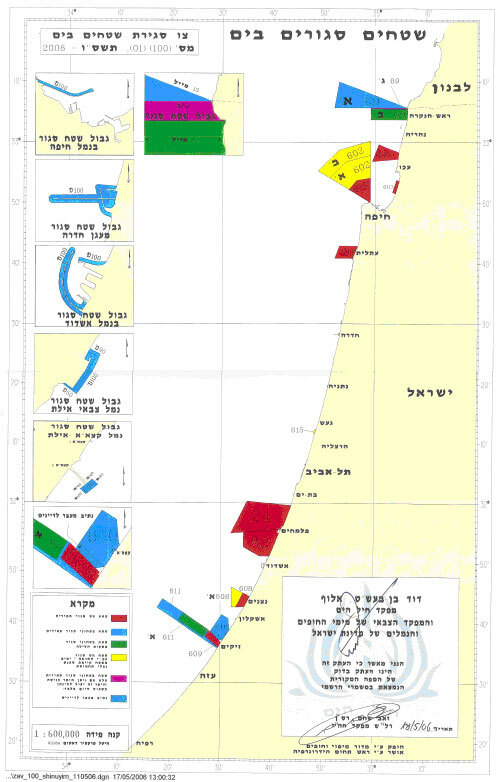 The area in between running the length of the Gaza coast is referred to as zone L. Both Maritime Activity Zones “K” and “M” are for the exclusive use of the Israeli Navy while MAZ L remains open for Palestinian fishing, recreation, and economic activities. As documented in Article XI of the Gaza-Jericho Agreement, several restrictions are enforced within zone L (prior to the withdrawal of Israeli forces from Gaza in 2005). Commercial fishing boats, for example, were restricted to a maximum speed of 15 knots while recreational boats were restricted from operating motors stronger than 10 horsepower and were forbidden from being more than three-and-a-half miles off shore. Personal watercrafts such as Jet-Skis were not allowed to operate. Foreign vessels approaching zone L from the open sea were not allowed within 12 nautical miles of the coast without prior approval. All vessels were banned from carrying weapons. The Palestinian Police Authority were to allowed up to eight control boats with a displacement of up to 30 tons and speeds less then 20 knots. The control boats were allowed to be equipped with weapons up to a 7.62 caliber. The Palestinian Police boats were allowed to operate up to six nautical miles from the Gaza Coast within zone L, in special circumstances and approval by the Israeli Navy up to 12 nautical miles. All Palestinian boats had to carry identification markings. On any given night, 400-600 Palestinian fishing vessels navigate the MAZ L and identifying potential terrorists is a task that often overwhelms Israeli Navy forces assigned the mission of patrolling the MAZs. On November 23, 2002, two Palestinian terrorists from the Palestinian Islamic Jihad (PIJ) attempted the first maritime suicide attack on an Israeli naval vessel since the Palestinian Intifada began in September 2000. Sailing with an explosive-laden fishing boat into Israeli-controlled waters off northern Gaza (MAZ K), the terrorist waited for an Israeli patrol boat to examine the situation. Approached by INS Daboor - an Israeli 20-m costal patrol boat - in order to warn it to turn back, the terrorist blew up the boat killing themselves and injuring four sailors. PIJ’s military branch, the Al-Quds Brigades, identified the suicide bombers as Jamal Ali Ismail, 21, from al-Breij, and Mohammed Samih al-Masri, 19, from Beit Hanoun. Both towns are in the West Bank. While the PIJ claimed that the suicide bomber succeeded in ramming their explosives-laden boat into the Israeli patrol boat, sinking it, and that an Israeli rescue boat retrieved the four casualties, the Israeli navy said the patrol boat was damaged but made it back to shore. Following the attack, the IDF closed the Mediterranean waters off Gaza, barring all Palestinian fishing. A second example of an attempt to strike an Israeli naval vessel was initiated by Hamas on January 17, 2003. The Israeli patrol boat INS Daboor observed a life raft within the Gaza’s northern maritime security zone (MAZ K), 2.1 nautical miles from Dugit. Following procedures the Israeli sailors tried to establish communication, as they did not receive any reply, the soldiers fired a warning shot into the air and afterwards towards the raft. Guided by a suicide bomber the booby-trapped raft subsequently exploded. Following the assassination of Hamas founder and spiritual leader Sheik Ahmed Yassin on March 22, 2004, the terrorist organization vowed to avenge Israel in graphic terms: "a strong, earthshaking response to make the sons of monkeys and pigs taste a painful death." During the following days several terrorist attacks were foiled because of heightened security measures in the Gaza Strip. On March 25, 2004, Hamas launched a maritime infiltration attempt at Tel Katifa at the northern end of the Gush Katif settlement block. Three armed Palestinians wearing diving gear and armed with an RPG rocket launcher, Kalashnikov rifles and grenades emerged under cover of darkness from the Mediterranean. Firing shots and RPG’s at the army post guarding the settlement the two terrorists were killed and a third was wounded and fled during the ensuing 15-minute gun battle. This, however, was not the first attempt to infiltrate a Jewish community within the Gaza Strip since 2000. On June 8, 2002, a navy control post in the northern Gaza Strip, near Dugit, identified at night time two terrorists swimming towards the coast. Opening fire, IDF soldiers killed at least one terrorist who was later found dead at the beach. The terrorist was wearing a bag containing four fragmentation grenades, a Kalashnikov assault rifle and four ammunition clips. A second attempt was made in August 2002. Terrorists attempting to infiltrate the Dugit settlement were spotted by an IDF patrol and killed before reaching shore. The latest attempt to infiltrate a settlement in the Gaza Strip (Dugit) was on November 9, 2004, when a Dabur coastal patrol boat discovered a terrorist swimming towards the Israeli shore. Not reacting to the warning shots and requests to stop, the terrorist was killed by the soldiers. With the start of the second Intifada, Palestinian terrorist groups in Gaza made an enormous effort to not only improve the quality of their terror tactics and home-made weapons, but also to import large amounts of quality weapons, including anti-tank rockets and Strela antiaircraft missiles. The Maritime transportation system with the ability to transport large amounts of weapons at the same time and Gaza’s geographic location near the Mediterranean, made maritime smuggling the preferred method. Furthermore, Iran’s interest to further the Intifada by transferring arms to the PA, made maritime smuggling - whether directly from its territory (Karine-A) or indirectly from Lebanon using its affiliated terrorist organizations the PFLP-GC and the Hezbollah (Santorini & Abu Hassan) - a necessary mean. On May 6, 2001, the Israeli navy captured the Santorini fishing vessel carrying weapons en route from Lebanon to the Gaza Strip. The ship had set off from the port of Tripoli in northern Lebanon, and was headed towards international waters to a rendezvous in the Gaza Strip, until it was intercepted by an Israeli missile boat 150 miles west of Tyre in international waters. The suspicisous vessel had been spotted by an aerial inspection plane. Santorini’s crew consisted of four members of Ahmed Jibril's Damascus based Popular Front for the Liberation of Palestine-General Command (PFLP-GC). According to Israel’s Ministry of Foreign Affairs (MFA), the Santorini and another boat, the Calypso-2, made three successful smuggling operations of which the first was in November 2000. According to the interrogation protocol of Dib Muhammad Rashid Awita, the Santorini was bought in the Syrian port of Awad as “Abd Al Hadi”. As the boat suited their needs, the boat was registered as Lebanese. Awita furthermore informed the Israeli security services that the weapons- which were later found carefully wrapped in waterproof packaging and stored in barrels ready to be dropped into the sea at a designated point off the Gaza coast, where they would be retrieved by boats manned by Palestinian security services - were transferred from Syria via the Damascus-Beirut road in a passenger bus with Syrian registration numbers to Zahlah and then to Tripoli in North Lebanon. The terrorists the transferred the weapons onto the Santorini at the bay of Jiyah while 25 Hizbollah members secured the shore and the roads leading to it. On March 23, 2003, an IDF Military Court sentenced the Lebanese crew of the Santorini to ten years in prison, and the Captain for 12 years for their role in the weapons smuggling attempt. One crew member was acquitted of all charges in December 2002. In an interview, Ahmed Jibril stated that the Santorini operation was "not the first shipment, nor will it be the last." Proof that the Santorini affair was officially sanctioned by the Palestinian Authority, as part of a larger maritime arms smuggling effort, came in the early morning of January 3, 2002. Israeli Defense Forces (IDF) naval commandos in an operation codenamed Operation Noah’s Ark seized the 4,000 ton freighter Karine A on its way to the Suez Canal, some 300 nautical miles off the Israeli coast. The operation to capture the freighter included both the Navy and the Air force. When brought to Israel’s southern port of Eilat, Karine A’s shipment revealed 50 tons of diverse weapons featuring both 122 mm and 107 mm Katyusha rockets, 80 mm and 120 mm mortar shells, various types of anti-tank missiles, anti-tank mines, sniper rifles, Kalashnikov rifles and ammunition. The shipment also included dinghies and diving equipment, which would have facilitated seaborne terrorist attacks from Gaza against Israeli coastal cities. Moreover, according to the IDF, the 122 mm Katyushas could have threatened Ashkelon and other coastal cities. According to Israeli naval intelligence, Adel Mughrabi, PA’s main weapons purchaser contacted Iranian and Hezbollah liaison officers; among them Imad Mughniyeh in October 2000 in order to negotiate the arms deal worth $2 million (excluding the ships necessary for transport). Mughrabi, with the help of PA Naval Police commander Juma'a Ghali and his deputy, Fathi Razem, purchased Karine A in Lebanon. Manned by a crew of Egyptians and Jordanians, who were unaware of the voyage’s purpose, Karine A sailed to Sudan, where it was loaded with regular cargo for Dubai. It was in Sudan that Adel Mughrabi, and four Palestinian naval officers, among them Col. Omar Akawi, the future captain, took responsibility of the ship. Discharging their cargo in Dubai, the Karine A headed towards the Iranian island of Kish where it linked up with an Iranian ferry and 80 water-tight crates filled with weapons were transferred to it. The crates were produced in Iran and were equipped with a special configurable system that determines how deep they are submerged. In preparation of the smuggling tour, Hezbollah trained one of the Palestinian crewmen, Salim Mahmud al Sankari, who was a captain in the Palestinian navy, in deep sea diving and operating the device. According to Sankari, the Lebanese trainer was also present at the handover of the weapons for additional training. Sailing towards Egypt, the ship had to divert to the port of Hodeida in Yemen due to technical problems. After crossing the Suez Canal, the ship was supposed to meet with three smaller ships that were purchased in advance and to unload the weapons onto them. According to the plan, the smaller ships were to leave the weapons near El Arish in Gaza, wherefrom the weapons were to be taken by the commander of the Palestinian Naval Police Juma'a Ghali and his deputy Fathi Razem. According to Mughrabi, Fuad Shubaki, head of the PA General Security's Financial Directorate handled the financial operation to pay for the ships' operation while Hezbollah paid for the weapons. However, it is the assessment of the Israeli MFA that Hezbollah did not have the necessary means and that the deal was financed by Iran. On January 12, 2002, Israeli naval boats and members of Shayetet 13 attacked a Palestinian naval police base in Gaza City, destroying two patrol boats in retaliation for the Karine A smuggling operation. On May 20, 2003, Israeli naval commandos intercepted an Egyptian fishing trawler approximately 100 nautical miles west of Rosh Hanikra. Abu Hassan was heading for the Gaza Strip from Lebanon, loaded with five metal boxes containing 122-mm rocket fuses, other weapons, and bomb-making components, including a radio activation system and electronic delay units. Among the six crew members, who mostly were not aware of the ship's mission, was Hamad Masalem Mussa Abu Amra, a Hezbollah bomb expert, who boarded the ship with 36 CDs which gave detailed instructions on how to manufacture different kinds of bombs, explosives and rockets, as well as advice on where a suicide bomber should stand in a bus to cause maximum fatalities. According to Israeli officials, this was the first incident of hi-tech smuggling which showed that the Palestinians were running short of bomb experts. It is believed that the operation was organized by deputy Naval Police chief Fathi Razam and Adel Almairibi. Both were already involved in the Karine A episode. The smuggling attempt occurred at a time when PA Prime Minister Mahmoud Abbas attempted to reach an agreement with Israel regarding the road map. Since the Abu Hassan episode, several other attempts to smuggle weapons through the sea were prevented by the Israeli navy such as on May 9 and 14, 2006. On August 17, 2002, Jordanian security services reacted to a tip by a concerned citizen and arrested four Saudi nationals who crossed the Saudi-Jordanian border by swimming through the Gulf of Aqaba. Intending to continue swimming until reaching Eilat, the terrorists intended to conduct a terrorist operation. Later that year, on October 16, 2002, the Israeli newspaper Maariv reported that Hamas military wing, Izz el-Din al-Qassam Brigades, planned to bomb a passenger ship in the port of Eilat. The plan foresaw the use of a Palestinian suicide bomber with an Israeli identity card to smuggle a video camera filled with explosives on a local tourist ship. Eilat was chosen due to the fact that no suicide bombing had been perpetrated in that city until that date. In preparation for the attack, the brother of the suicide bomber was to conduct the essential intelligence on possible targets and buy a ticket for the suicide bomber. The plan was disrupted by the arrest of a senior leader of the Izz el-Din al-Qassam Brigades. This led to the arrest of a resident of Sawakhara al-Sharkia, who -under interrogation - exposed the described plan and gave up the identity of the brothers who later were arrested. Ten people were killed and 16 were wounded at 17:00 on Sunday afternoon, March 14, 2004, in a double suicide bombing at the Ashdod Port. The two Palestinian suicide bombers, both 18, hid behind a false wall in a 15 meter container and succeeded in infiltrating the Israeli Port of Ashdod. Emerging from the shipping container wearing army uniforms, the two split up. The first suicide bomber blew himself up close to a group of workers standing next to a machine repair workshop, killing five people. The second terrorist detonated his bomb moments later near the outer fence on the sidewalk in a storage and refrigeration area. Hamas and Fatah (Al-Aqsa Martyr Brigades) claimed responsibility for the attack. The bombers were identified as two 18-year-olds, Nabil Massoud and Mahmoud Salem, from the Jabalya refugee camp in the Gaza Strip. The port of Ashdod is considered to be one of the most sensitive strategic sites in Israel, and contains a number of bromine tanks and other hazardous chemical storage facilities. The attack showed that even the most stringent security regulations can be broken. For example, not only was the container inspected at the Karni Crossing but also at Ashdod port. Both times the human eye even with the aid of technology equipment failed to detect the false wall. Abdel Aziz Atallah - an officer in the Palestinian preventative security service – was arrested in a joint operation between Israel’s internal security service (GSS) and IDF forces on June 6, 2004. Atallah was responsible for arranging the release of the containers from the crossing. During his interrogation, Atallah noted that both Hamas and the Al-Aqsa Martyrs' Brigades viewed the Karni Crossing as a weak point in Israel’s defensive measures around Gaza and therefore had prepared for Atallah to smuggle another pair of suicide bombers through it into Israel. Moreover, Hamas, assisted by Atallah, was planning to purchase trucks and establish a company for transporting containers from the Gaza Strip into Israel, using it as a guise for smuggling terrorists into Israel. In response to the Ashdod attack, Prime Minister Ariel Sharon cancelled his immediate plans for peace negotiations with the Palestinians, maintaining that “they are doing nothing to stop attacks against Israelis”. Five cruise ships carrying some 5,000 Israeli tourists have been diverted from Turkish ports to Cyprus following the arrest of Syrian national Louai Sakka, 32, on August 6, 2005 in Diyarbakir, south-east Turkey. According to Turkish intelligence, Sakra was planning to attack Israeli cruise ships in international waters with speedboats packed with explosives. Born as Loa'i Mohammad Haj Bakr al-Saqa, Louai Sakka also used aliases under the names of Lian bin Mohammed Saka, Abu Mohammed al-Suri, Abu Haya al-Suri, and Ala al-Din. Accused of being an Al Qaeda operative, known as Aladdin al-Suri, serving between the group's leaders and suicide bombers, Sakka hid his tracks by using an array of fake IDs, undergoing plastic surgery and finally faking his death in Fallujah, Iraq, in late 2004. Sakka didn’t surface until August 2005 when an accidental explosion forced him to flee his safe house. Louai Sakka was also wanted in Turkey for financing the 2003 bombings of two synagogues, the British Consulate and the local headquarters of HSBC bank in Istanbul which killed 58 people. Sakka proclaimed that he does not have any regrets: "I was going to attack Israeli ships. If they come, my friends will attack them." Moreover, according to Sakka’s interrogation transcript, his mission to attack the Israeli cruise ships was financed by Taliban chief Mullah Omar, who allegedly gave him $50,000. Suspects tried in Turkey for the 2003 bombings said they were originally planning to attack an Israeli cruise ship in the Mediterranean. According to a court indictment, the terrorist cell had prepared a pickup truck with 30 bags containing 50 kilograms of ammonium nitrate-fuel oil slurry each and 10 five-kilogram boxes of explosives connected to a detonator which would be controlled by the suicide driver. In November 2003, the suicide bomber was sent to the Mediterranean port of Antalya, where he waited for eight days for an Israeli cruise ship to dock. When the cruise ship failed to call at the port of Antalya due to inclement weather, the suicide bomber returned to Istanbul, where he attacked the British Consulate General, killing 18 people, including the British Consul General while wounding hundreds of others and demolishing part of the consulate building. On August 19, 2005, Al Qaeda of the Two Rivers attempted to strike two U.S. amphibious warships - the USS Ashland and the USS Kearsarge moored in Jordan’s only seaport Aqaba - using three Katyusha rockets. The Al Qaeda cell consisted of four members lead by Iraqi Mohammed Hamid Hussein. The cell consisted also of Syrian national Mohammed Hassan Abdullah al-Sihly and his two sons Abdullah and Abdul-Rahman. While Abdullah and Abdul-Rahman al-Sihly entered Jordan together with Hussein through the eastern desert border at al-Karama on Aug. 6 using forged Iraqi passports, Mohammed Hassan Abdullah al-Sihly was living in Amman. Once in Aqaba, the terrorists rented a hilltop warehouse overlooking the Gulf of Aqaba where the rockets were assembled and mounted on rocket launchers. It is believed that the cell smuggled the rockets from Iraq into Jordan hiding them in the modified gasoline tank of their Mercedes. By controlling the launch of the rockets by a timing device, three of the terrorists were able to escape to Iraq prior to the attack, while Mohammed Hassan Abdullah al-Sihly was arrested on August 22, 2005 by Jordanian security forces. Two rockets overshot the warships, hitting a Jordanian military warehouse and killing its guard while a third rocket landed in Eilat, Israel, but did not cause any major damages. Both amphibious ships left Aqaba shortly after the failed attack. On August 23, 2005, Al Qaeda of the Two Rivers, then led by Abu Musab al-Zarqawi, claimed responsibility for the attack Aqaba, saying it was chosen because of the status of the city as a center for tourism and the media attention a successful attack would have generated. Following the abduction of two Israeli soldiers by Hezbollah (operation Truthful Promise) on July 12, 2006, and followed by several rocket attacks against civilian communities, Israel declared a state of war against Hezbollah using its land, air and sea forces to strike terrorist infrastructure. While on mission to shell Beirut international airport, the Saar-5 class corvette Ahi Hanit, with a crew of 71 was hit Friday, July 17, 2006 by an Iranian made radar guided C 802 land-to-sea missile killing four sailors. At the time of the incident the Ahi Hanit was located ten nautical miles off the coast of Lebanon. Launched by Hezbollah at 20:00 hours, a pair of C 802 missiles, weighing 715 kilos, with a range of 120km, and equipped with a strong anti-jamming capability were lunched from the Lebanese shore, one hitting Ahi Hanit near the waterline at the helicopter deck while the second missile missed the Ahi Hanit and hit an Egyptian merchant vessel sailing in international waters. The Egyptian ship drowned and its crew was rescued by another merchant ship. An investigation was conducted by a special committee under the supervision of Brigadier General (Res.) Nir Maor, to explain why Ahi Hanit’s sophisticated Barak anti-missile defense system, which was designed to intercept anti-ship missiles was not employed. The investigation found that not only did the officer responsible for electronic devices on the ship not take into account the possibility of Iranian missiles reaching Hezbollah's arsenal and therefore worried that an overuse of the system would affect its functioning, but that he had shut down the Barak anti-missile system. Moreover, the investigation found that the radar on the ship had been functioning at less than 50 percent accuracy at the time of the attack. According to the probe, the officer did not report this to the ship’s captain. A second reason why Ahi Hanit’s automatic missile defense system was turned off might lie in the fact that the ship operated in the vicinity of the military air corridors used for attacks flown against Beirut. Developed to automatically engage any target that flies in their defense zones that is not squawking the proper identification friend or foe (IFF) transponder signal, the officer might have feared shooting down friendly aircraft as many UAVs and Helicopters do not carry IFF transponders. Fifteen minutes after Lt. Gen. Dan Halutz informed the world that the attacks matched the objectives set out by the government, Hezbollah’s Secretary General Hassan Nasrallah in a phone interview with Al Manar TV informed his listeners that one of Israel’s warships was ablaze. Nasrallah’s interview was another successful move in the psychological war to undermine Israeli morale. Given the possible range of the C 802, Hezbollah acknowledged that they possessed a weapon that was able to reach Tel Aviv, a region that until then felt relatively safe from Hezbollah’s Katyusha rockets. I. From 1970 to 2006 – What has changed? Summarizing maritime terrorism operations since the 1970s, one has to admire how the different terror organizations, acting in terrorist groups quick to adapt new methods and to maximize their resources, have learned to adapt to this rapidly changing environment. For example, when the Israeli Navy succeeded in foiling direct maritime terrorist attempts from Lebanon, the terrorists from the various Palestinian organizations moved on using indirect maritime terrorism tactics involving a mother ship or used other means such as mines to attack Israeli targets. Several key observations can be presented. First, maritime terrorism operations have mainly moved from secular organizations such as Fatah, the Palestinian Liberation Front (PLF) and the Popular Front for the Liberation of Palestine – General Command (PFLP-GC) to Islamic organizations such as Hamas, Palestinian Islamic Jihad, Hezbollah and recently Al Qaeda. Second, with this shift, Israel also experienced a change of tactics away from maritime infiltration operation, in which the aim was to free prisoners and get worldwide media attention (Savoy etc.) to suicide operations in which the attacker rams or blows up a boat laden with explosives next to a preferred target. As Dr. Shaul Shai remarked, “Islamic groups regard suicide attacks as a central tool in their struggle against Israel as well as a mean to torpedo agreements and arrangements between PA and Israel.” As secular organizations under the umbrella of the PLO became the ruling party they also moved from maritime terrorist attacks to maritime smuggling operations. In recent times, we have again witnessed a change in tactics, while in the 1970s the most common direction of a maritime terrorist attack was from the sea to land in order to murder or conduct a hostage-bargaining operation. Since 2000, it seemed to change from land to sea as witnessed in suicide attacks in Gaza using life rafts and in the rocket attacks both on the U.S. amphibious warships USS Ashland and the USS Kearsarge (2005), and the recent attack on Saar-5 class corvette Ahi Hanit (2006). The Aqaba rocket attack, however, has also shown that organizations, such as Al Qaeda, - despite a religious ruling enabling suicide missions - avoid perpetrating such attacks if it believes it can realize its goals in other ways. Third, maritime terrorism operations such as the attempted bombing of cruise ships (2002) tend to be perpetrated out of the ambition to cause mass casualties. And last, terrorist organizations, operating in the Israeli arena developed closer ties with state sponsors of terrorism, such as Iran, which gives terrorist organizations access to modern, sophisticated weapons, such as the Iranian made C 802 land-to-sea rockets. As discussed earlier, terrorist organizations that possess maritime terrorism capabilities are the PLO and its sub organizations Fatah, PLF and PFLP (1993 under PA), PFLP-GC, PIJ, Hamas, Hezbollah and recently Al Qaeda. Palestinian Liberation Front (PLF) under Muhammad Zaidan (Abu Abbas) became one of the most successful terrorist organizations using maritime terrorism tactics. Their earliest attack was the maritime infiltration and murder of the Haran family (1979). PLF is most well known for their 1985 hijacking of the Italian cruise ship Achille Lauro. During the hijacking, PLF terrorists murdered elderly Jewish American citizen Leon Klinghoffer. In 1990, PLF attempted to raid the Tel Aviv shoreline using six speedboats launched from a mother ship. According to Abu Abbas, the preparation for this operation had taken nearly three years and cost about three million dollars. The raiding party underwent intensive training in Libya, including the use of rubber boats and speedboats; they were trained in firing from ship to shore. Abu Kassem was the commander of the PLF naval forces during that time. On May 30, 1992, four Palestinian terrorists from the PLF attempted to attack a beach party by swimming five kilometers from Jordan to Eilat. One of the water-proof containers used in the operation began to leak in the water and caused one of the men to drown with it. A second container leaked and had to be cut loose. The remaining two terrorists reached Coral Beach where they killed an unarmed Israeli security guard and attempted to massacre tourists, but were prevented by police and army troops. PLF signed the 1993 Oslo accords and officially renounced terrorism against Israel. According to the Oslo related Amnesty program, Abbas was permitted to move back to Gaza in 1996 but moved to Baghdad in 2000 where he was arrested by American Special forces in April 2003 for his involvement in the Achille Lauro hijacking. Abbas died at age 56 while in U.S. custody (2004). Palestinian Authority (PA) was established in 1993 under the Oslo agreements and quasi consists of the PLO. PA conducted primarily maritime smuggling operations of weapons into the Gaza Strip. The best known examples of such operations are the Santorini, Karine A and the Abu Hassan incidents. In order to facilitate the smuggling operations, the PA collaborated with Hezbollah and PFLP-GC. PA’s main smuggling coordinator was Adel Mughrabi, who worked closely with PA Naval Police commander Juma'a Ghali and his deputy Fathi Razem. Furthermore, the PA created a small but elite Palestinian Naval Police Unit. Trained in diving and underwater sabotage, the unit is not confined to maritime operations only. Most of the unit’s members once belonged to Fatah’s naval unit. The Palestinian Naval Police Unit deployed some 600 officers in Gaza and another 400 in the West Bank (as of 2004). Popular Front for the Liberation of Palestine (PFLP) was founded under Dr. George Habash as a Marxist-Leninist, secular Palestinian nationalist movement in 1967 and joined the PLO in 1968. The PFLP vehemently opposes the peace process with Israel and continues to advocates the use of violence against Israel. PFLP under Dr. George Habash recognized the value of the Israel’s merchant shipping stating that Israel as an abandoned island, surrounded by enemies, can only stay in contact with friendly sates by either air or sea transportation … “hence we must block these lines”. On October 1989, PFLP conducted a maritime suicide attack against an Israeli patrol boat of the coast of Lebanon. Popular Front for the Liberation of Palestine - General Command (PFLP-GC) was established in April 1968 by Ahmed Jabril. Through rejecting the Oslo accords, the PFLP-GC has remained largely pro-Syrian and anti-PLO. The group's operational infrastructure is primarily located in Syria and Lebanon. It usually launches attacks from Lebanon, including the first maritime suicide attack in the Lebanese arena on August 25, 1988. During the second Intifada, the PFLP-GC helped PA to acquire weapons (Santorini). One of Ahmed Jabril’s sons, Jihad Jibril was according to the Sudi Al Watan Newspaper (May 21, 2002), one of the most outstanding figures in the procurement of arms, ammunition and explosives and their transfer by boat to the PA. The Palestinian Islamic Jihad (PIJ) was founded in the late 1970s by a group of radical Palestinian activists living in Egypt. The group believed that the Muslim Brotherhood had become too moderate and had abandoned the Palestinian cause. Inspired by the Islamic Revolution in Iran (1979), the PIJ blended Palestinian nationalism, Sunni Islamic fundamentalism, and Shi'a revolutionary concepts. PIJ believes in the annihilation of Israel and liberation of all of Palestine. PIJ remains a relatively small organization with a limited support base mainly in the West bank and Gaza. The PIJ conducted their first maritime suicide attack of the coast of Gaza against an Israeli patrol boat on November 23, 2002. The two suicide bombers came from al-Breij and Beit Hanoun, both in the West Bank. On February 5, 2005, the Media Advisor to the Prime Minister of Israel reported that Israel’s Security Agency (ISA) had uncovered an attempt by the PIJ to establish a maritime terrorism unit. According to the report, Iyad Abd Issa Alouan, 24, a resident of Khan Yunis and fisherman by profession, was recruited by a senior Islamic Jihad terrorist known as Abu Islam. According to Interrogation transcripts, Abu Islam asked Alouan to purchase several life boats and motors. Furthermore, Alouan was asked to rent several safe houses in the northern Gaza strip and to purchase weapons from an arms dealer. Abu Islam stated that PIJ had $500,000 at his disposal to fund the new unit. Hamas was created in 1987 by Sheikh Ahmed Yassin as a violent outgrowth of the Muslim Brotherhood at the beginning of the first Intifada. The Muslim Brotherhood is a Sunni, Islamist, and religious movement that originates in Egypt and seeks broad social, moral, and political reforms based upon Islam. In August 1988, Hamas released its official charter in which Hamas is dedicated to creating an Islamic state in the territory of Palestine. Furthermore, according to Hamas' charter, the land of Palestine has been endowed to Islam, and it is therefore the duty of all Muslims to liberate Palestine through violent jihad. Hamas was elected in January 2006 as the government of the Palestinian people. Overthrowing the government, Hamas took sole control of the Gaza strip in June 2007. Hamas' maritime capabilities are limited and only used when all land based terror options are exhausted. For instance, following the assassination of Hamas' founder and spiritual leader Sheik Ahmed Yassin on March 22, 2004, the terrorist organization vowed to take vengeance against Israel in graphic terms. During the following days, several terrorist attacks were foiled due to heightened security measures in the Gaza strip. On March 25, 2004, Hamas launched a maritime infiltration attempt at Tel Katifa at the northern end of Gush Katif settlement block. Hamas prefers maritime infiltrations (shore to land) over maritime suicide attacks and has so far not created a serious effort to create a maritime unit. The only real success Hamas experienced was on March 14, 2004, when two suicide bombers succeeded to infiltrate Ashdod port and killed 10 people and wounded 16. Both Hamas and Fatah claimed responsibility for the attack. Hezbollah, founded in 1982, is an umbrella organization of various radical Islamic Shi'ite groups and organizations which receives substantial financial and philosophical support from Iran. While the majority of its operations take place on land, Hezbollah also invested heavily in building maritime capabilities. Hezbollah is assisted by Iran, specifically the Revolutionary Guards. Most of Hezbollah’s terrorist operations are directed at Israel, its primary adversary. Its attacks, however, can take place worldwide; according to Singapore's security service, Hezbollah plotted to bomb American and Israeli ships at dock in Singapore in the 1990s. To accomplish this mission, Hezbollah operatives recruited five Singaporean Muslims to assist with surveillance and logistics preparations. The plan was to load a dinghy with explosives and ram it into a ship either in the Singapore Straits or in Singapore’s harbor. Since 1982, Hezbollah conducted several maritime smuggling operations and also served as coordinator for the PA’s effort to smuggle arms into the Gaza Strip (Karine A, 2002). According to an Iranian news report, Hezbollah has a submarine unit and a navy commando unit that operates Chinese-manufactured speedboats capable of targeting the Israeli navy. Moreover, during the Second Lebanon War, Hezbollah succeeded in hitting the Israeli Saar-5 class corvette Ahi Hanit, on Friday, July 17, 2006 killing four sailors. The Lebanese used an Iranian-made radar-guided C 802 land-to-sea missile in the attack. Al Qaeda (meaning “the base”) is a member of the largest alliance of Islamic groups, the World Islamic Front for Jihad against Jews and Crusaders. Al Qaeda movement was founded in 1988 under the leadership of Osama Bin Laden to function ideologically and operationally at local, national, regional and global levels. Prior to 9/11, the leadership of Al Qaeda saw their mission as the training of as many operatives as possible and thus successfully staying beneath the radar of most intelligence agencies. However, Al Qaeda had to adapt to the changes brought about by “Operation Enduring Freedom” (October 2001) when allied forces gathered to fight U. S. President George Bush’s “Axis of Evil.” This offensive successfully destroyed Al Qaeda's training bases, along with command and control headquarters, in what Dr. Rohan Gunaratna described as the “terrorist Disneyland” of Afghanistan. Al Qaeda’s horizontal network structure assured the continuation of what militant Islam views as defensive ihad. Although some operational capabilities where lost, Osama Bin Laden and his deputy, Ayman al-Zawahiri, continued to provide the ideological and religious inspiration, while their followers and affiliate terrorist groups continued to carry out the actual terror attacks. The result is that today there are “many Al Qaedas rather than the single Al Qaeda of the past.” These ad-hoc groups consist of like-minded individuals, often Muslim converts, with no prior involvement in terrorism. The new trend of extremists with (petty) criminal records being involved in terrorist attacks is noteworthy: this was the case in the train bombings in Madrid. These adversaries are arguably more difficult to detect and to counter. Al Qaeda, unlike traditional separatist-irredentist terrorist groups (like the PIRA), does not want to become part of today’s international (political) system: rather, it seeks to replace it entirely. Al Qaeda sees this struggle not as one of weeks or months, or even years, but of decades. Therefore, its ideology is absolutist and non-negotiable. This reduces the possibility of finding a political solution to nearly zero. Al Qaeda’s fatwa (trans. : religious opinions) call for total war, permitting the use of chemical, biological, radiological or nuclear agents against their enemies. · having underwater demolition teams. Until his capture in Aden on November 2002, al-Nashiri developed plans to attack U.S. warships in the Strait of Hormuz and Gibraltar, to bomb the fifth fleet headquarters in Bahrain, and to crash a small aircraft into the bridge of an allied navy vessel docked in the U.A.E.’s Port Rashid. Due to his involvement in the USS Cole bombing, al-Nashiri was convicted in absentia and sentenced to death by a Yemeni court. Al-Nashiri is currently detained by the U.S. at Guantanamo Bay, Cuba. Al Qaeda’s first successful maritime attack occurred on October 12, 2000 when the USS Cole, an Arleigh Burke class destroyer, was attacked by a small craft loaded with 270 kg of C-4 explosives while making a routine refill stop in the port of Aden, Yemen. Steered by two Saudi suicide terrorists, Hassan al Khamri and Ibrahim al-Thawar, the small craft exploded alongside the USS Cole 47 minutes after the refueling was initiated, killing 17 U. S. servicemen and injuring 37 more. The attack caused $250 million in damage to the warship taking 14 months to repair. As a fast-learning terrorist organization, Al Qaeda was able to exploit the vulnerabilities of its adversaries (a stationary ship with a lax crew) while learning from its mistakes (USS Sullivan). The example with the USS Cole has shown that a terrorist organization can, with even relatively miniscule funding of $40,000, create damages costing in the hundreds of millions of dollars. Moreover, the attacks showed that maritime attacks could take place from land to sea, in the port area, or near it. Since the time spent out on sea for the duration of a maritime terror attack is only a few minutes, it makes it nearly impossible for maritime security services to successfully prevent an attack. Thus, the logical starting point in preventing future maritime attacks, as Dr. Rohan Gunaratna stated, is to disrupt the terrorist infrastructure on land where an identified terrorist can be much more effectively targeted by security services. The failure to detect the planning and preparations of a maritime terrorism attack will lead to an attack attempt by that terrorist organization. VII. What are the risks in Israel today? Ports are one of the major security weaknesses in the maritime transport arena. They were constructed to be widely accessible by land and sea in order to facilitate an increasing amount of materials moving through them. Their infrastructures are often interlined with that of the neighboring cities. Their hazardous storage facilities were built according to a cost benefit analysis, not according to security considerations. Moreover, thousands of workers and seamen stream daily into them. Israeli ports have yet to implement a secure biometric security system. According to the ISS, Palestinian terrorist organizations have produced fake port identification cards. Given the daily security threats Israel’s ports try to minimize the danger by establishing fences that surround the port and operating cameras along the fence. The extensive size of current mega-ports, however, precludes a 100 percent closed and secure environment. For example, the Ashdod port screens all incoming containers, and hence, it is viewed by many as the world’s safest harbor. Nevertheless, on March 14, 2004, two 18-year-old Palestinians hid behind a false wall in a 15-meter container and succeeded in infiltrating the Israeli Port of Ashdod. The subsequent terror attack killed 10 port workers. As the incident pointed out, the human eye behind the technology can sometimes miss an important detail. Moreover, attacks on ports can be launched against a ship or port facility from either the sea, underwater, from land or from the air. As ports are essential links in the supply chain, the disruption of one port could lead to additional economic costs as shippers have to make alternative arrangements. Another weakness in the maritime trade is the containers in which goods are transported. In 2006, 15 million containers were making 230 million journeys. With an average of a five percent inspection rate worldwide, containers can easily be used to smuggle illegal goods, human beings or weapons. The problem is that port workers can’t see the contents of a container, or properly assess that the container seal is intact. Furthermore, a sealed container has no guarantee of a safe inspection because seal mechanisms are vulnerable to manipulation. Therefore, containers are often viewed as the most vulnerable link in the maritime trade transport system. Israel’s port handled, according to the Ministry of Transport in 2006, 1,205 million containers. The fear that terrorists could exploit the container system first came to fruition on October 18, 2001 when port authorities in the Italian port of Gioia Tauro discovered a stowaway within a shipping container. The container was complete with a bed, heater, toilet facilities and water. Mr. Ami Segal, the current head of the Israeli Customs Authority, disclosed on June 24, 2007 that a security agreement had been signed between the Israeli Customs Authority and the Jordanian Customs which will enable electronic seals to be applied on containers moving from Jordan via Israel to the U.S. According to Segal, Jordanian security officers will check the containers prior and during the loading stage and will apply an electronic seal which will enable the tracking and tracing of the container while on route to Haifa port. With this measure, Israel hopes to increase the security of containers passing through its territory. In recent years, however, the focus shifted towards the use of a container as delivery vehicles for weapons of mass destruction. The fear was fuelled by Al Qaeda’s fatwa (2003) to use WMD against the enemies of Islam, and by the surfacing of plans to acquire CBRN weapons. The latest attempt was that of Al Qaeda of the Two Rivers trying to use CBRN in order to strike the Jordanian royal family and the Jordanian intelligence headquarters in 2004. According to Jordanian intelligence, the attack could have caused as many as 80,000 dead and as many as 150,000 injured. As Al Qaeda’s plan for 2004 provided for two vehicle-borne suicide attacks, it is imaginable that Al Qaeda could use the container, loaded on a merchant ship, as a delivery system to attack port or costal cities. Israel Electric Corporation Eshkol is operating the only offshore gas rig in Israeli territorial waters off the coast of Ashkelon. Due to its geographical location, the gas rig lies within striking distance of terrorist organizations located in Gaza and thus requires special protection. Israel is currently conducting intensive negotiations with British Gas, which holds rights to a natural gas field that was discovered off the coast of Gaza in order to build further gas rigs. Moreover, several of Israel’s most important power plants are located on the shore of the Mediterranean. Among them are power plants such as the one located south of Ashkelon, Tel Aviv and Hadera. Building on the shore in order to facilitate the process of supplying the power plants with much needed fuel now becomes a security obstacle. Located 2.1 nautical miles from the Gaza Strip, Ashkelon’s power plant is the most endangered as terrorists in a speedboat would only need about 10 minutes to cover the distance. · The vessel can be used as a weapon against a port, offshore facilities and other maritime vessels. Previous maritime terrorist attacks by Palestinians and Al Qaeda, such as the attack on April 1988 against an Israeli patrol boat in Lebanese waters or the USS Cole and MV Limburg, tended to use small explosive loaded boats to attack their target. Although it seems likely that terrorist organizations will continue on this path due to a positive cost / benefit analysis, maritime security experts tend to view a growing threat in the possible use of a Liquefied Natural Gas (LNG) tanker to attack port cities. Experts such as former National Security Advisor Richard A. Clarke and the 2004 Institute for the Analysis of Global Security (IAGS) study found that LNG is an easily explosive material: “a similar attack to the USS Cole in 2000 could cause at least half a cargo hold's worth of LNG to seep out of the ship and ignite… in just over three minutes, the fire could spread two-thirds of a mile from the ship.” Nevertheless, the Federal Energy Regulation Authority (FERC) stated that LNG in its liquid (transport) state is not explosive. According to FERC, when LNG becomes a gas it is not explosive if it is unconfined (which would be the case in a terrorist attack on a vessel in transit). Moreover, due to the dangerous nature of its cargo, today’s LNG tankers have a robust cargo security system in place. During the Iran-Iraq war in October 1984, an LNG cargo vessel took a direct hit by an Exocet anti-ship missile. According to a Distrigas spokeswoman, the ship did not explode and the crew was able to contain the fire. As Israel currently does not have any LNG terminals, the threat is low. However, as the first tender for such a terminal is proposed for the end of 2007, Israel should carefully consider the threats posed by LNG and implement necessary security measures. In addition to the perceived danger through LNG and LPG carriers, maritime security experts also focus on certain extremely hazardous bulk shipments, such as atomic waste or ammonium nitrate. The latter is used worldwide as an agricultural fertilizer. However, mixed with fuel oil, ammonium nitrate becomes a powerful explosive treasured both by commercial demolition teams as well as terrorists. Being easy to handle and widely available, ammonium nitrate has been used in terrorist attacks across the globe, from the first World Trade Center truck bombing (1993) to those in Oklahoma City (1995), Nairobi (1998), Bali (2002) and Istanbul (2003). One of the worst disasters involving two ships carrying ammonium nitrate occurred in Texas City on April 16-17, 1947. The incident occurred after loading 2,300 tons of ammonium nitrate into the French bulk carrier Grandchamp. The explosion created a five-meter tidal wave while the blast wave destroyed most of the town of 15,000 residents. Five hundred and sixty-eight people were counted dead, and the economic damages ranged into the hundreds of millions of dollars. With the hardening of military vessels and the strategic shift towards mass transportation systems, cruse ships have increasingly attracted the attention of terrorists. Besides being highly iconic, Al Qaeda favors the possibility to find up to 5,000 (Queen Mary II) targets in a small, confined space. The preferred method of an attack would either be by poisoning the food or using speed-boats laden with explosives to ram the cruise ship. Moreover, an important consideration is the increased probability that the victims will be of Judeo-Christian (the primary target off the iihad agenda), without risking wider Muslim interests. An example of this directive toward cruise ships occurred in August 2005. Al Qaeda operative and Syrian national Lu’ai Sakra was arrested for planning to attack Israeli cruise ships while visiting Turkey with explosive laden speedboats. · A “mother ship” can be used to launch an attack using either small explosive loaded boats or a different weapons system. Al-Nashiri planned to use a mother ship in order to attack targets in the Strait of Hormuz. Previously, this tactic was used by several other groups, such as the LTTE and the different Palestinian groups. The majority of such attacks that took place in Israel happened in the 1970s. An example of an attack launched from a mother ship was on the Tel Aviv Savoy Hotel by Fatah on March 5, 1975. Taking the hotel guests hostages, the eight terrorists demanded the release of 11 terrorists, including the terrorist leader Hilaryon Qapuzhi. Storming the building, the IDF (Israel Defense Force) succeeded in freeing three of the hostages while eight were killed by the terrorists. Following the Savoy attack, Israel security officials had to rethink their maritime defense strategy to counter the increasing threat of maritime terrorism, such as launching rockets from ships outside the national waters (less than 12 nautical miles) against a major Israeli city. · The vessel can be sunk in a narrow chokepoint in order to disrupt infrastructure. Global and interdependent trade follows the shortest sea way often passing narrow and shallow waterways called chokepoints in order to get their merchandise from “point A” to “point B”. Six of the nine chokepoints in the world are located in geographical areas where local terrorist groups with ties to Al Qaeda possess maritime capabilities. A successful closure of one or two of these straits, trough sinking for instance a VLCC tanker (Very Large Crude Carrier) or Oil tanker, would not only partially cut Israel off the world market but also increase the overall shipping costs thought the increase of insurance fees worldwide and the rerouting to saver but more time consuming shipping routs that might include the transport over land. Therefore, Israel’s consumer ultimately would have to bare increasing prices for all imported goods. The successful closure, for example, of the Malacca Strait by attacking and sinking a VLCC tanker and thereby disrupting the sea-lane could stop all traffic through this specific chokepoint. Using the Lombok strait would increase the average travel time by four days, which would increase by an additional seven days were it necessary to sail around Indonesia altogether. Taking into account that an average day of a larger container ship costs up to $ 125,000, the economic burden of the closure of the Malacca Strait would be between $500,000 – $875,000 per ship. · Ships can be used to either smuggle weapons / terrorist operatives into another country or to launder illicit funds for the terrorist organization. The ability to freely transport personnel and/or weapons around the world is one of the most important factors for international terrorists. Palestinian and Lebanese terrorist groups used the maritime transportation system for decades to smuggle weapons, technology and personnel. Moreover, Al Qaeda, according to a Norwegian Intelligence source, possesses a “phantom fleet” of 23 ships. The ships were used to smuggle explosives to Kenya and Bali in preparation for the attacks in 1998 and 2002. It was also used to smuggle terrorist operatives into foreign countries (Europe). An example was the case of the Twillinger, a Nova freighter that transported eight Pakistanis, traveling with false identification and large sums of money, in February 2001. Ostensively, the purpose was to provide a steady flow of funds by transporting either legal goods or engaging in criminal activities, such as drug smuggling and human trafficking. Flags of convenience were originally created to avoid heavy taxes and stringent inspections which might not allow the vessel to operate. Today the flag has become the best friend of terrorist organizations as it allows them / the boat owner to hide behind a wall of secrecy. · create a ship security plan and maintain a security officer on board. The downside is that these requirements are only for “SOLAS” class ships. Therefore, it doesn’t apply to warships, government vessels, fishing vessels and ships smaller than 500 tons. Moreover, a high percentage of these ships are found in maritime terror plagued areas, such as South East Asia and the Persian Gulf. The ISPS code by the IMO imposes significant additional costs to ship owners. This high cost penalty is particularly acute for small vessels. Ship owners in developing countries cannot comply and compete in the global market. In addition, the ISPS code is seen as a U.S. code responsible for national port and ship security, presenting difficulties to other nations involved. Officials of many developing countries consider the ISPS code as a measure to counter maritime terrorism and provide security to the West. Their financial priority, however, is with their own economic development. The Container Security Initiative (CSI), introduced in 2002, is a U.S. initiative involving a series of bilateral accords that allow for the forward deployment of U.S. Customs and Border Protection (CBP) officers. Their duty is to identify and inspect suspicious containers before they are placed on vessels destined for the United States in order to extend the zone of security outward so that American borders are the last line of defense, not the first. Moreover, with the establishment of the C-TPAT (Customs-Trade Partnership against Terrorism) CBP recognizes that only through close cooperation with the ultimate owners of the international supply chain, such as importers and carriers, can it increase cargo security. International importers can expedite the processing of their cargo while complying with the rules of the CBP. Countries that do not implement CSI procedures will be at a disadvantage because their cargo will be subjected to extensive examination. Israel’s two main ports of Ashdod and Haifa are part of the CSI. To date, more than 45,000 companies have agreed to participate in C-TPAT. Nevertheless, the governments of several countries remain skeptical. They consider the underlying purpose of “extending of the zone of security outward” as a method to shift the terrorist threat away from the U.S.
Lastly, the Proliferation Security Initiative (PSI) was announced by President Bush in May 31, 2003. It aims to combat the proliferation of weapons of mass destruction by sanctioning the right to stop, board, and, if necessary, seize a vessel on the high seas if it is suspected of smuggling CBRN materials. Currently, 15 countries have joined the PSI, with major region gaps in membership. For example, Singapore is the only member country from Southeast Asia. Another major weakness of the PSI is its limited authority under international law. Thus, at present, warships can only halt ships in international waters when they have the consent of the state under whose flag the ship is sailing. Operation Active Endeavour (AE) is a NATO maritime operation in the Eastern Mediterranean as part of an international campaign against terrorism. The operation is one of the measures resulting from NATO's decision to implement Article 5 of the Washington Treaty. Operation Active Endeavour started October 26, 2001 and was extended in March 2004. It now covers the whole of the Mediterranean Sea, including the Strait of Gibraltar. This was confirmed in the North Atlantic Council on March 16, 2004. The operation in the Strait of Gibraltar included escorting non-military ships. Until its suspension in May 2004, NATO forces escorted 488 ships through the Strait of Gibraltar. The surveillance operation utilizes ships, aircraft and submarines to build a picture of maritime activity in the operational area. Since the beginning of the operation, nearly 79,000 merchant vessels have been monitored. Over 100 suspicious ships were boarded in accordance with international law. On June 28, 2004, the Alliance at the NATO Summit in Istanbul, decided to enhance Operation Active Endeavour by inviting Mediterranean Dialogue countries to participate. Since the beginning of October 2006, Israel exchanged letters with NATO setting the stage for Israel’s contribution to Operation Active Endeavour. This process was only recently concluded successfully (June 6, 2007) with the signing of a Tactical Memorandum of Understanding (TMOU). This TMOU will establish effective co-operation between NATO and the Israeli Navy, in particular the exchange of data relating to maritime situational awareness and the posting of a high-ranking Israeli naval officer with the rank of Lt.Col. to the headquarters of Operation Active Endeavour, in Naples. Having experienced decades of maritime terrorism attacks, Israel developed a comprehensive coastal defense system based on both military and civilian aspects. It is the interaction between both parts that guarantees success. Coastal Defense is mainly the Israeli Navy's responsibility. The task is to protect Israel’s coast, its sovereignty at sea and to ensure its vital shipping. It consists of intelligence gathering by Israel’s intelligence services, patrols outside Israeli territorial waters, coastal radar defense shields, the establishment of maritime security areas and force protection programs. The first protection stage consists of intelligence gathered by the various Israeli intelligence services and the Foreign Ministry. Israel also relies on land-based aerial reconnaissance patrols (Shahaf Maritime Aircraft) and patrols conducted by Israeli naval ships (Sa’ar 4-5), in order to secure a maritime situational awareness of its western border. While the outer border of these controls is set at 100 nautical miles off the Israeli Coast, the lateral borders are specified by the territorial waters and air traffic regulations of each neighboring country. On closer range (up to 32 nautical miles) nine Israeli radar stations situated along the coast from Rosh Hanikra in the north to Erez near the Gaza Strip, provide the Central Command Center (C4I), through its three local command centers Haifa, Ashdod and the Red Sea Region, with a complete picture of all maritime movements. Furthermore, these regional command centers can direct up to eleven coastal patrol boats (Mediterranean coastline), in order to intercept suspicious ships / floating objects. Following the withdrawal of the IDF forces from the Gaza Strip in August 2005, Israel’s navy found itself replacing its physical barriers and reconnaissance posts, such as Tel Ridan in Gaza, with technical sensors near the border with the Gaza Strip. These technical sensors consist of infiltration detection sensors such as the Long Range Reconnaissance and Observation System (LORROS) built by Elbit which teamed up with IAI's subsidiary Elta System’s EL/M-2226 coastal surveillance radar system. EL/M-2226 is designed to detect patrol boats at ranges up to 32 nautical miles and rubber boats at ranges greater then 10 nautical miles, in waves up to 5 ft. It can also detect submarine periscopes or even small airborne targets. El/M-2226 is able to track more than 200 targets at the same time. Mounted atop 820ft.-high smokestacks at the nearby Ashkelon power station, the dual system provides the operator with a deep view into the Gaza Strip. Moreover, as part of Israel’s effort to reduce spending, the Israeli Navy will replace part of its manned coastal surveillance stations with unmanned radar stations by 2008. Unmanned radar stations, stationed on high vantage points far from population centers along the coast, can be more powerful and therefore provide greater coverage and resolution. While the Israeli navy gave control of MAZ L to the PA, it retains control over both security zones MAZ M and K and will be able to enter zone L at will. Furthermore, according to news reports, the IDF is building an anti-terror barrier off the Gaza Coast, which is aimed at thwarting Palestinian terrorists swimming up to the Israeli coast and stopping ships up to 50 knots. The barrier, according to the reports, will consist of cement pilings burrowed into the sandy bottom, in the first 150 meters. Beyond that, the barrier will extend for a further 800 meters, in the form of a 1.8-meter-deep fence floating beneath the surface. On the northern border with Lebanon, off the coast of Rosh Hanikra, there are seven linked buoys reaching out 4,200 meters from the coast. The buoys were initially intended to demarcate the territorial waters with Lebanon, but they were later used to embed sensors helping the naval station at Rosh Hanikra to detect intrusion. In order to safeguard sensitive areas such as the northern and southern Mediterranean border, Israel has declared that the security zones are closed to civilians. These security zones are monitored intruder detection systems, such as the Cedar and Spider systems of Controp Precision Technologies. On the Lebanese border, these security zones reach deep into Lebanese territorial waters. The areas in question are updated annually by the Israeli Ministry of Transportation. Additional safeguards in force are the military escorts which each foreign naval vessel heading for Haifa receives. The vessel is met six nautical miles off the coast by an Israeli patrol boat and then escorted until its final mooring spot. The harbors themselves are secured by human lookouts, for example the Haifa port employs three such installations to safeguard the harbor. Upon entering the port, some of the vessels are examined by divers for dangerous materials attached to their hulls. In order to increase the security of Israeli ports, the Navy established a special unit in November 2005, Snapir (fin), which will protect the Haifa, Ashdod and Eilat ports. Besides port security, the unit's main tasks are the prevention of terrorists' infiltration into Israel, using small boats or swimming and diving, the inspection of suspicious ships entering Israeli territorial waters and assisting law enforcement authorities. The Snapir unit will use small Tzir'a (Hornet) vessels, which are designed to sail in shallow waters and are capable of speeds of 45 knots. According to Navy commander Maj. Gen. Ben Ba’ashat, the unit will be made up entirely of female fighters as, “unlike other naval units, the new unit does not require soldiers to sleep on board the ships and therefore female soldiers are well suited for the position”. On the civilian side (merchant shipping), according to the Israeli Ministry of Transportation, Israel does not rely only on security regulations as defined in the IMO, which must be provided before crossing the 100 nautical mile barrier off the Israeli coast, but being mindful about improving their security measures, they have established several additional security measures. A ship heading towards Israel will initially be questioned once radar contact has been established. Ships heading to Israel, however, must file a “Notice of Arrival” 48 hours earlier with the Israel Ministry of Transportation, thus giving Israel’s intelligence, customs and merchant marine unit time to investigate the registrations and cargo. 25 nautical miles from port, the vessel must state its position and the Captain will be questioned again upon entering Israeli territorial waters. If necessary, the ship will be identified by a nearby patrol boat. All maritime vessels approaching Israeli ports have to use one of three shipping corridors which lead either to Haifa, Hadera and Ashdod / Ashkelon. While on approach, merchant ships are not allowed to exceed 12 knots and yachts 15 knots. Furthermore, the Israeli Navy cooperates with the Israel Police, Customs Authority, Bomb Squad and the Ministry of Transportation Inspection Unit, in order to conduct security checks of vessels approaching and entering Israeli ports. A terrorist attack on Israel's maritime interests is a credible scenario among the general terrorist threat contingencies facing Israel. Israel is not only highly dependent on maritime trade, but is also part of a region where terrorist groups possess maritime capabilities. Moreover, having continuously improved their maritime capabilities and tactics over the past decades, these groups have shown that they are able to penetrate Israel's coastal weak links. Targets could be identified by these groups, as Ashkelon's power station, Eshkol's gas rig, coastal defense forces and Israeli cruise ships. Attacks on any of Israel's ports could cause serious economic disruption and loss of life, as all ports are located near major population centers. While Israel in general has adapted successfully to existing maritime threats, it has almost never been able to foresee future modi operandi. However, as maritime targets are harder to attack than most onshore targets, terrorist organizations will continue to prefer attacking those while maritime smuggling operations will continue. While the establishment of better interconnected command and control centers, and the use of unmanned, aerial and maritime UAVs will allow Israel to decrease its reaction time on the home front, on the international front Israel's maritime assets are still wide open. International counter-measures such as the ISPS code and U.S. initiatives like the Container Security Initiatives (CSI) and Proliferation Security Initiative (PSI) can only be regarded as the first step in order to close this Achilles' heel. 63. Tagliabue, John. “Italians Identify 16 in Hijacking of Ship,” New York Times, November 20, 1985, p. A3. This is due to the fact that many regular weapons / explosives do not operate efficiency in the hash maritime environments, eg. Salt water etc. Dr. Shaul Shai. The Confrontation with the Terror in the Gaza Strip 1971; and Israeli navy captures October 1971 a boat with four terrorists while one escaped. For instance on April 11, 1974 three terrorist from the PLFP-GC infiltrated Israel from Lebanon. Storming an apartment in Kiryat Shmona they killed 18 people and wounded 16. The terrorists who died during a gun battle with Israeli troops left a communiqués demanded that Israel release 100 prisoners including Kozo Okamoto. In the night of the October 24 to 25, 1974, two terrorist tried to penetrate the border swimming from Lebanon etc. Which included for instance intelligence collection, and military raids in Lebanon. Force-17’s main function was the protection of the PLO leadership but also conducted terrorist operations and attacks on rival Palestinian factions. “Inner cabinet discusses “far-reaching response” to Ashdod bombing.” Maariv International, 15 March 2004. Radar waves have proven to increase the cancer rate.